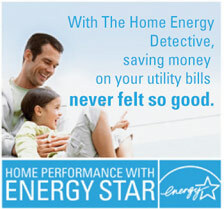 Arlington, VA (WUSA) -- His company is called "The Home Energy Detective" and Troy Tanner makes house calls. His tools of the trade include smoke, fans and infrared cameras. His mission is to show home owners how their house is wasting energy. By finding leaks in windows and walls and duct work, Troy can save homeowners big bucks. Insulation, or lack thereof can also be a big culprit to your electric bill. Even using a powered roof fan can cause more problems than it solves. Troy explains that the powered attic fan can draw cold air out of the house through any fixtures in the ceiling that are not made "air tight". I spent some time with Troy Tanner on the job in Arlington this morning and he showed me what he does and gave some great tips on things any homeowner can do to help their bottom line. The cost of the home energy audit is $400. For that, the homeowner gets a complete list of things that need fixing. After that, the homeowner can choose to have Troy's crew do the work, hire a separate contractor or do the work himself. Please watch the related video to see my conversation with Troy Tanner, "The Home Energy Detective".